Class size is limited to a total of 20 to 25 students selected from across the state. The goal of the program is to have a diverse class, so selection is based in part on race, ethnicity, gender, age, sexual orientation, gender identity, disability, background, geographical factors and law schools attended. To learn more about how to apply to the program download the Application Instructions. 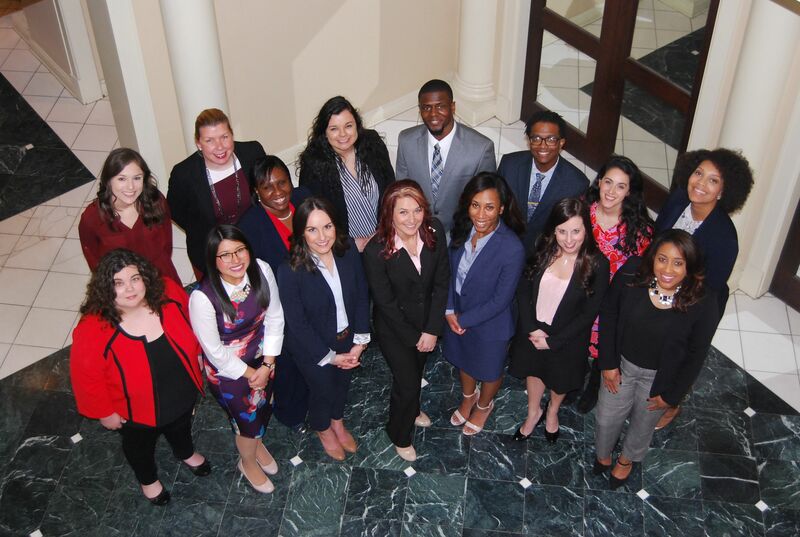 Applications the 2019 Diversity Leadership Institute Class are due by 5 p.m Central time on November 30, 2018. Download the application here. Keep reading below for more information! The 2019 Diversity Leadership Institute program (“DLI”) will begin with an opening retreat January 18-19, 2019 in Nashville. Attendance is required, but double occupancy hotel accommodations and mileage reimbursement will be provided for participants living outside of Nashville. At the retreat, participants will get to know fellow class members, be introduced to leadership and diversity concepts to be explored throughout the program and have the opportunity to network with Tennessee lawyers and TBA Leadership. Class members also will meet during the State High School Mock Trial Competition March 22-23, 2019, in Nashville. Again, attendance is required, but double occupancy hotel accommodations and mileage reimbursements will be provided for those who live outside the Nashville area. *If selected for the program and taking the MPRE in March, you agree to register for a testing location in Nashville and take the test Saturday morning after attending the DLI programming on Friday. The DLI program will conclude with a final session, service project and graduation ceremony June 14-15, 2019, during the TBA Annual Convention in Nashville. Again, attendance is required, but double occupancy hotel accommodations and mileage reimbursements will be provided for those who live outside Nashville. During the six-month leadership program, participants will be required to have two meetings with a selected or assigned mentor, complete at least one community service activity as a group and attend two continuing legal education seminars, at least one of which should focus on a topic related to diversity. To help participants meet these requirements — and network with practicing lawyers in their local area — class members will be invited to attend public service projects, educational seminars and membership events planned by the TBA YLD. Participants also are encouraged to get involved in activities sponsored by their local bar associations as a way to meet these requirements. Applicants must be enrolled in a Tennessee law school, and must be in their second, third or fourth years of study. Applicants must be (or become) TBA law student members prior to Opening Session. Students interested in applying for the program who have not yet joined the TBA may do so online. Join here or learn more about the benefits of law student membership. Participants must attend three in-person meetings during the six-month program. **Potential conflict with MPRE test date. If selected for the program and taking the MPRE in March, you agree to register for a testing location in Nashville and take the test Saturday morning after attending the DLI programming on Friday. Participants must attend 2 CLEs during the 6-month period (one related to diversity). TBA sponsored CLEs are free to TBA law student members. Participants must meet with their assigned mentor twice during the 6-month period. Participants must compete at least one community service activity. The deadline for applying is 5 p.m. Central time on Nov. 30. The Selection Committee will notify candidates of its decision by mid-December.